The function, history and symbolism of the menorah from deep antiquity to its use as the emblem of the state of Israel. 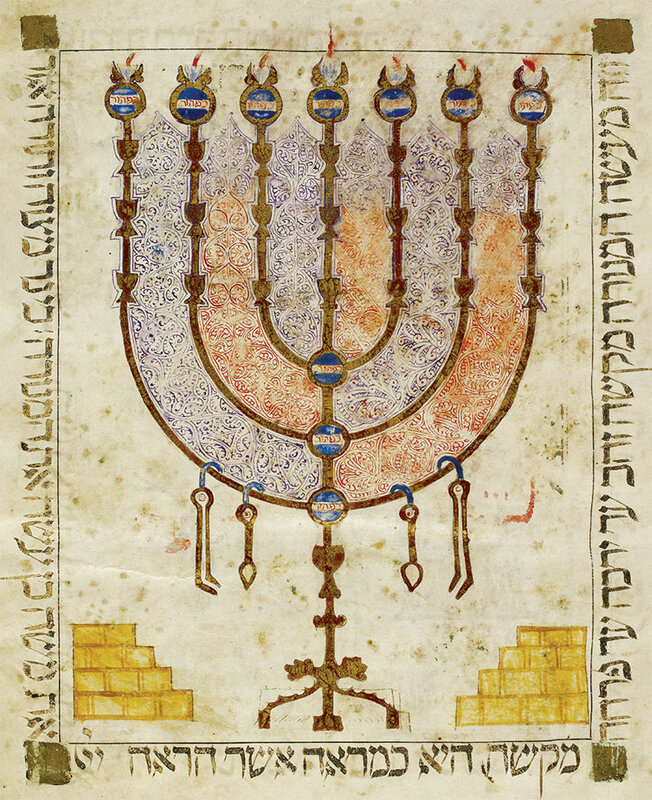 Menorah from the King’s Bible by Isaac ben Judah of Toulouse, 1384. As a child, Steven Fine was fascinated by the flickering of the candles on the Chanukkah menorah. The Jewish festival of Chanukkah, also known as the festival of lights, commemorates the victory of the Maccabees over the Seleucid Greeks in 161 BC. On winning, the Maccabees purified the Temple in Jerusalem and re-established within it traditional Jewish worship. The candles on the Chanukkah menorah that Fine so loved refer to the story that the victorious Maccabees only found a small jug of oil, enough for one day, for the eternal lamp (menorah). Miraculously, it lasted for eight days, enough time for more oil to arrive. The menorah is the oldest Jewish symbol in continuous use, the seven-branch candelabra used in Temple worship, which, with nine branches, is still used by Jews to celebrate Chanukkah. It is described in the Torah (the five books of Moses, known as the Pentateuch), known from both first and second Temples and became a symbol of Jews and Judaism. Today, it is also ultimately the emblem of the modern state of Israel and appears in the official standard of Israel’s president. In the Arch of Titus in Rome, one can see Roman soldiers carrying a huge menorah away from the newly destroyed Temple in Jerusalem, alongside a Torah scroll and other Temple vessels, to a victorious Rome. Titus may have thought removing the menorah from Jerusalem in ad 70 would break, or at least tame, the Jews. Instead, the menorah prevailed as a major symbol of Judaism, from Second Temple period coins around Jerusalem to mosaic synagogue floors, from tombstones where a menorah identified a Jewish body to symbolic designs in mediaeval rabbinic commentary on the Torah. In Rome, images of the menorah abound in churches and synagogues, as well as on the Arch of Titus. Fine then draws a parallel between the use of the menorah in the decoration of late 19th-century ‘great’ synagogues, both orthodox and Reform, and its use in Catholicism at the same period and earlier. He argues that Catholics used the symbolism deliberately to reflect the subjugation of the Jews, as depicted on the Arch of Titus. Early 19th-century Roman Jews had won political and social freedoms under Napoleon, only to lose them again in 1815 as ghetto rule was reimposed. Fine deftly illustrates this point with particular memorials, such as that of the Montanaro family, depicting a weeping virgin lighting the menorah candles. Later interpretations tried to suggest this was a sign of respect for Judaism. It was nothing of the kind. It was demonstrating that Christianity had ‘won’. Meanwhile, the building of those ‘great’ synagogues, decorated with menorahs in prime position, were the opposite – namely, a demonstration of Jewish victory over Christian imposed restrictions, showing Jews were part of wider society and could build synagogues to impress, just as Christians built great churches to demonstrate their wealth and stability. The First Jewish legion (the battalions of Jewish volunteers who fought with the British army against the Ottomans in the First World War) wore the menorah as their badge. No surprise then that it became the emblem of modern Israel. Since then, it has been the symbol of Soviet Jews clamouring to leave for Israel and that of Jews who inhabit the right wing politically, both in Israel and in the diaspora. Even stranger, some Jews truly believe that the Catholic Church still owns the original Temple menorah and is keeping it hidden in the vaults of the Vatican. Fine’s reader is left with questions unanswered. Is the menorah the only continuous symbol or has it been so reinterpreted as to be different symbols at different times? Is it genuinely an emblem of Jewish defeat, or does it encourage us to believe, as we light the candles, that good can triumph over evil and that God’s light will prevail? The history fascinates, but greater analysis is still needed of the menorah’s true meaning today. Julia Neuberger is Senior Rabbi at the West London Synagogue and a crossbench member of the House of Lords.